Dwarfism in the Friesian horse breed. a: A female dwarf next to two normal female Friesian horses. 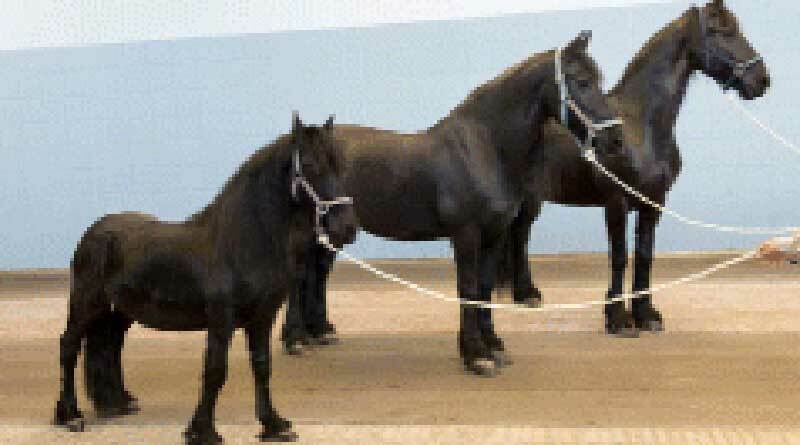 The dwarf has a height at the withers of 1.12 metresr; the horse in the middle has a height of 1.54 metres, which is close to the minimum allowed by the breed standard (1.53 metres); the horse on the right has a height of 1.66 metres. b and c: The typical rib deformity seen in the Friesian dwarf. The gene mutation responsible for the typical form of dwarfism seen in Friesian horses has been identified by researchers in the Netherlands. The study team traced the condition to a splice mutation in the B4GALT7 gene on chromosome 14. This mutation severely reduced expression of the gene, resulting in dwarfism. Crosses between carriers could be prevented by screening breeding horses for the mutation, Peter Leegwater and his colleagues reported in the journal BMC Genomics. Inbreeding and population bottlenecks in the ancestry of Friesian horses had led to health issues such as dwarfism, they wrote. The limbs of Friesian dwarfs are short and the rib cartilage overdevelops inward, while the head and back appear normal. A striking feature of the condition is the flexor tendon laxity that leads to hyperextension of the fetlock joints. The researchers from Utrecht, Wageningen and Ghent universities, wanted to identify the gene defect that caused the recessively inherited trait in Friesians in order to understand the disease process at the molecular level. The DNA of two dwarfs and one control Friesian horse was sequenced completely for the research. They localized the genetic cause to the p-arm of equine chromosome 14, with further work pinpointing it as an error in the B4GALT7 gene. This mutation led to the typical dwarfism phenotype seen in Friesian horses, they concluded. Mutations in B4GALT7 in humans are associated with two rare conditions in humans, Ehlers-Danlos syndrome progeroid type 1 and Larsen of Reunion Island syndrome. Growth retardation and laxity in ligaments are common manifestations of these syndromes. Leegwater was joined in the research by Manon Vos-Loohuis, Bart Ducro, Iris Boegheim, Frank van Steenbeek, Isaac Nijman, Glen Monroe, John Bastiaansen, Bert Dibbits, Leanne van de Goor, Ids Hellinga, Willem Back and Anouk Schurink. Peter A. Leegwater, Manon Vos-Loohuis, Bart J. Ducro, Iris J. Boegheim, Frank G. van Steenbeek, Isaac J. Nijman, Glen R. Monroe, John W. M. Bastiaansen, Bert W. Dibbits, Leanne H. van de Goor, Ids Hellinga, Willem Back and Anouk Schurink. Fabulous and thank you for identifying the gene mutation! One less thing to worry about.